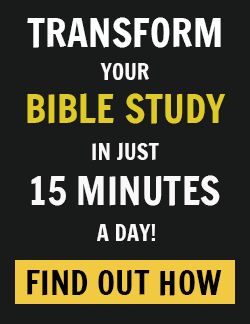 There’s a conversation in the Bible I would have loved to have overheard firsthand. It’s among the three women who were on their way to the tomb of Jesus to anoint His body with spices and perfume. Because He had died on a Friday, and the Jewish Sabbath was the next day, His body hadn’t been anointed and prepared for burial like it would have normally have been. Joseph of Arimathea, a highly respected member of the Jewish council who lived expectantly on the lookout for the kingdom of God, had worked up his courage, gone to Pilate, and asked for Jesus’ body (Mark 15:42-45). Pilate agreed, so Joseph wrapped Jesus’ body in linen and placed Him in a cave-like tomb cut out of a rock — unprepared for burial. Then, he had a massive stone rolled against the entrance to the tomb. The stone probably weighed at least two thousand pounds, and it would have been rolled down an incline to seal the tomb most likely by as many as twenty men. This was customary at the time to prevent grave robbers from stealing the body or other objects inside the tomb. And because Jesus was such a figure of notoriety at the time, there were also armed guards stationed in front of His tomb as another measure of protection. So, on Sunday morning, just after sunrise, the three women — Mary Magdalene, Mary the mother of James, and Salome — were on their way with spices to perfume Jesus’ body. Imagine how sobering their walk must have been. Imagine how despondent they must have felt. Their spirits had been crushed. The one who had given them purpose, value, dignity, the one whom they had loved was now dead. Jesus had been their teacher, their Lord. They thought He was going to be the Messiah, and now He was gone. And even though He had been dead for close to two days, long enough to have a stench, they still wanted to anoint Him for burial. Set our alarms before sunrise. But they forgot one BIG practical detail. The one that separated them from the Lord they loved. Who will remove that stone? A two-thousand-pound stone that normally took twenty people to move — downhill into position. Why didn’t we invite any men along? Like more than twenty of them? Impossible. Immoveable. Too large. Too heavy. Too out of their control. A solid object standing between them and Jesus that they couldn’t move with their own strength. Sound familiar? How many of us have come to this same realization, that there is an immoveable object between us and Jesus, and there is no way for us to remove it in our own strength? When dreams haven’t been realized. When bills can’t be paid. When marriages won’t work. When children seem out of control. When habits can’t be broken. When grades can’t be made. When people can’t be pleased. When emotions can’t be contained. When fears won’t subside. We all have known those kinds of stones, and they can feel just as heavy as the one that sealed Jesus’ tomb. We all know what it is to face seemingly insurmountable obstacles in our lives — huge immovable objects that block our future. Things that seem like no-one can ever remove them from our lives. Things we expect to live with forever. Stones that seem to seal the death of our dreams, hopes and desires. Like these women, we wonder, Who will roll away the stone from the entrance of the tomb? The women had finally stopped talking about the stone and looked up. When you look up, your perspective changes. When you look up, you see unexpected things you never thought you could see. These women came to the tomb expecting one thing, but found something entirely unexpected. What was impossible was suddenly possible. The unimaginable was suddenly imaginable. The inconceivable was suddenly conceivable. The immoveable had been moved. He has risen! He is not here. The stone was rolled away so the women could get in — not so Jesus could escape. He didn’t need it moved, but they did. And what the women could never have done for themselves was done for them — and Jesus does the same for us. Jesus removes the stones that block our access to Him. He does what we can never do. Why? Because impossible is where He starts. 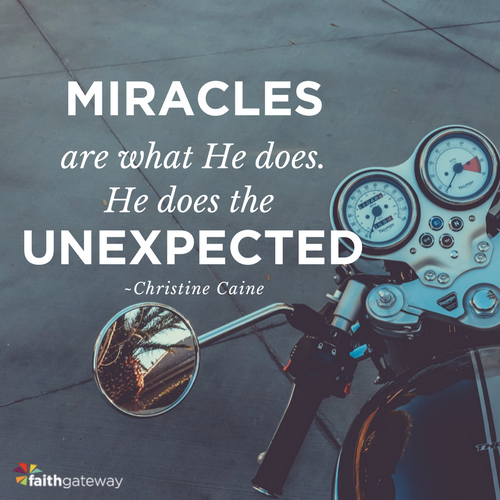 Miracles are what He does. He does the unexpected. I don’t know what you’re facing today, but it’s time to stop looking at the stones that seem immoveable. It’s time to stop looking down and look up! It’s time to stop looking back and look up! It’s time to stop looking around and look up! Look up to the resurrected Christ because where you look is where you will go, and it’s time to go forward and fulfill all that God’s has created you to be and called you to do. It’s time to expect the unexpected. 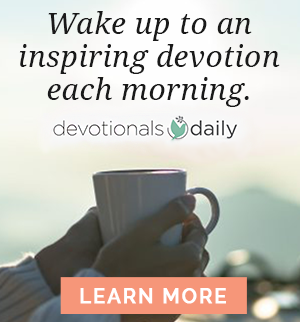 Original devotion written for Devotionals Daily by Christine Caine, author of Unexpected, copyright Christine Caine.